North Ronaldsay sheep are an ancient breed, part of the family of Northern European short-tailed sheep. Other members include the Soay sheep and the Iceland sheep and other native breeds spread across the north from the Baltic to the North Atlantic. The sheep are small and hardy, with most of the males – and also some of the ewes – having curling horns. They live on the shore on a diet of seaweed and are confined there by the 13-mile-long sheep dyke. When other native sheep breeds were modified over the years by crossing with larger breeds, North Ronaldsay sheep have not had a specific breeding programme for improvement, so the wool that the sheep produce is similar to what the primitive breeds of sheep produced in the distant past. The colours of the fleece range from white through various shades of grey and brown to black, and colours can also be mixed to produce variegated yarns. The fleece is double-coated, so clipping – which is mostly still done with hand shears – must wait for the lith (the gap between the old and new fleece) to rise. The outer fleece is weather-resistant, with tough hairs allowing the water to run off. Beneath it is a very warm high-quality fleece which yields yarn soft enough to be worn next to the skin. This is similar to what happens with cashmere goats, which also have a double fleece, with a fine soft underdown and a straighter and much coarser outer coating of hair above it. 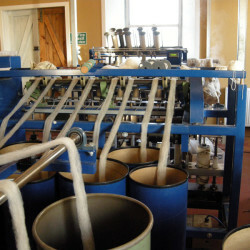 To make use of the underdown, the fleece needs to be de-haired, and this is one of the processes in the production of yarn in North Ronaldsay. 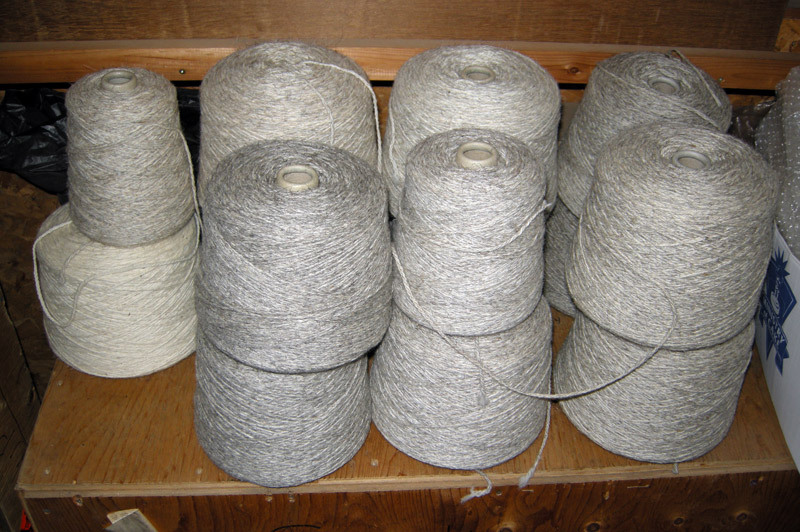 A Yarn from North Ronaldsay Ltd is a small business based in North Ronaldsay, whose main aim is to process and promote the fibre from the island’s native sheep. It started off as a community-based project under the auspices of the community council. Then in 1996 it became established as a company. The original idea was to buy the fleeces from the growers at a higher rate than was being paid by the wool board, to put some value back in the fleeces and send it south for spinning. The yarn was then returned and mainly sold locally as wool or knitted garments. In 1999 a sheep conference was held on the island as part of the Orkney Science Festival. At the conference one of the delegates first sowed the seeds of spinning our own yarn on the island with a mini mill supplied by a Canadian Company. As it became increasingly more difficult to find large mills prepared to do small runs of fleece, we then looked more seriously at the idea of spinning our own fleece. 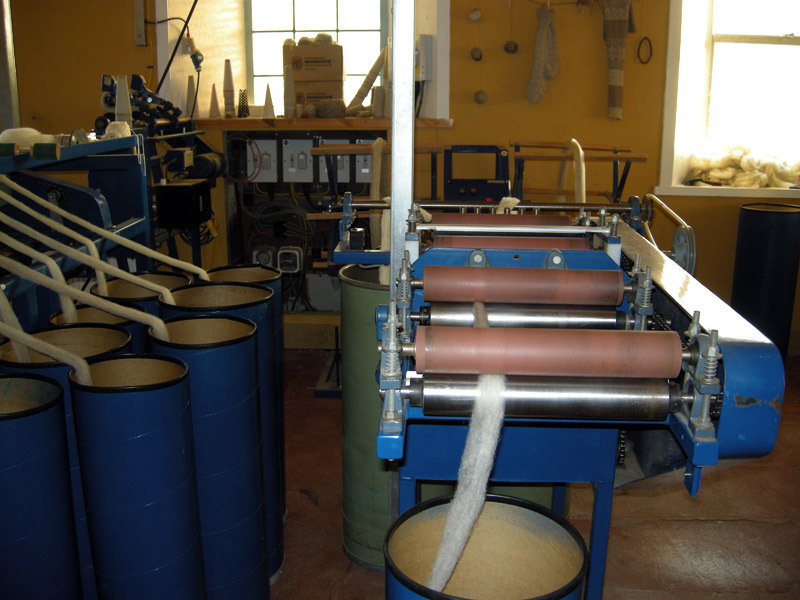 In 2001 we went out to Prince Edward Island to visit Belfast Mini Mills, who produce scaled-down spinning equipment for cottage industry. 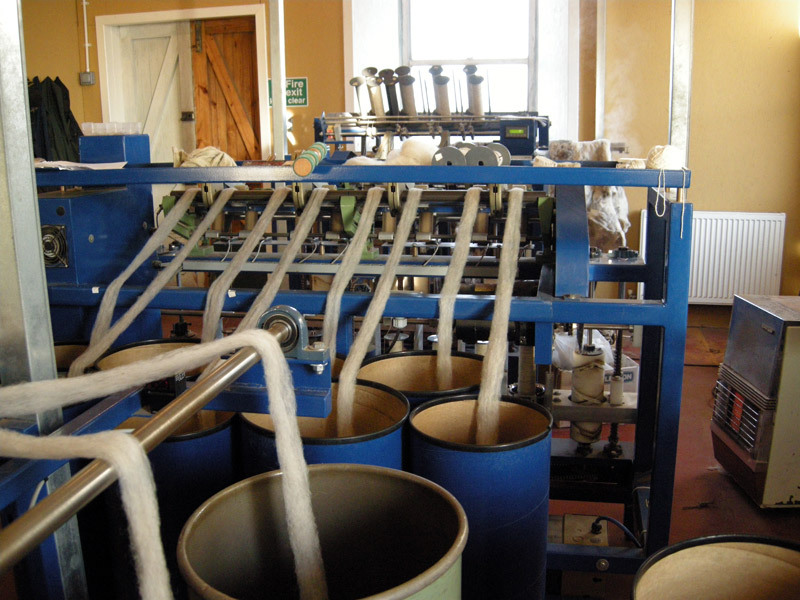 The small scale and flexibility of the equipment demonstrated that we would have more control over the selection of fleeces, and could produce small batches of high-quality yarns. It took two years to secure funding before the equipment finally arrived in the spring of 2003 occupying one of the newly refurbished lighthouse buildings. When the lighthouse became automated, the redundant buildings were transferred to the North Ronaldsay Trust, with the lightkeepers’ cottages being converted into self-catering holiday accommodation, café and interpretation centre, and the former workshop area was then available for the wool machinery. 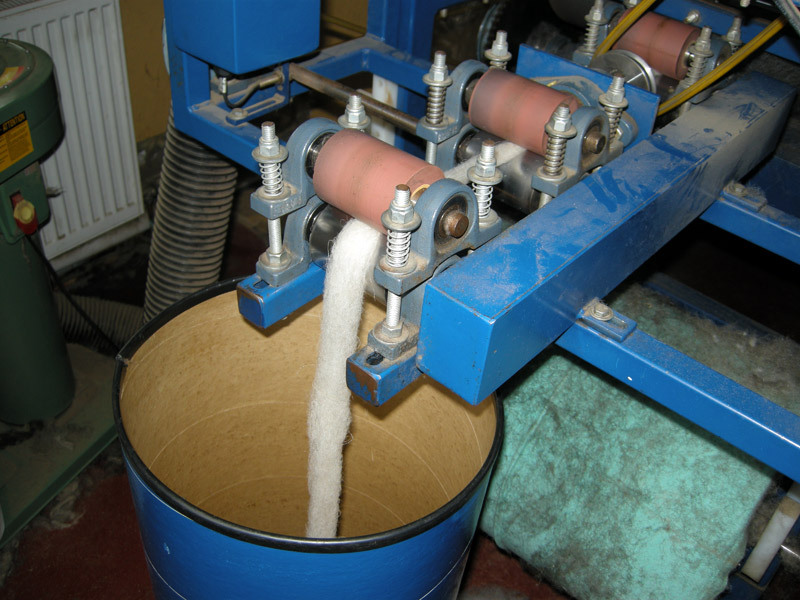 With the use of the mini mill, the company has evolved from selling aran and machine knitting yarns to selling rovings, batts, felt, yarn and knitwear. On receiving the fleeces they are first sorted, graded, skirted and washed. 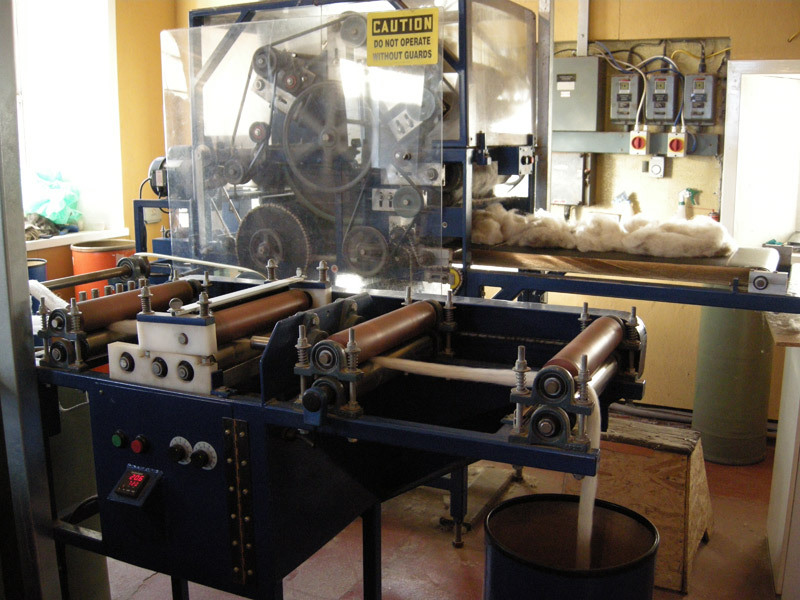 After being washed and dried, the fibre goes through the picking machine where it is opened and conditioning oil is sprayed over it to protect the fibres during further processes. 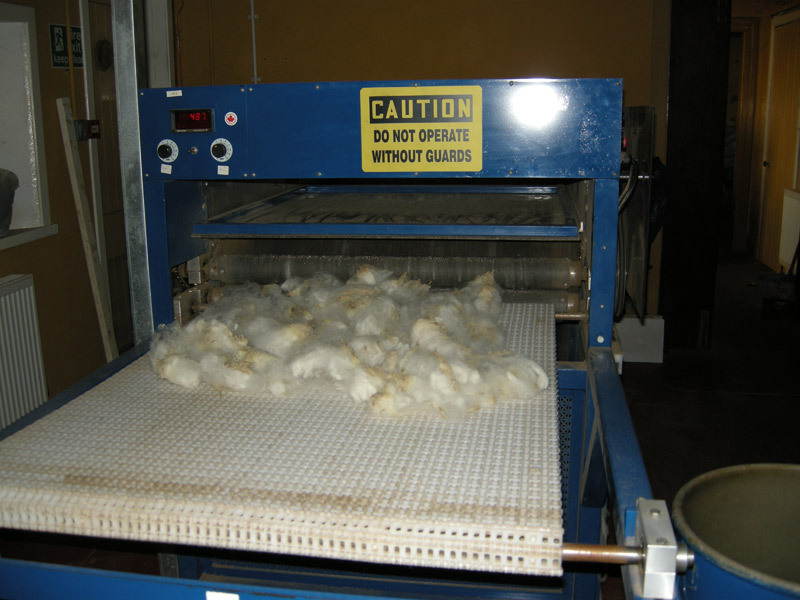 In the next processing stage, the coarser fibres are removed as it goes through the dehairer. 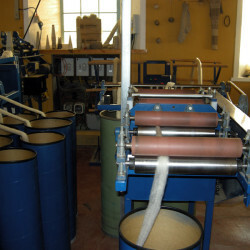 Next stage is the carder where the fibre is combed out and made into rovings or batts. It is now ready for handspinners or felters. For further processing in the mill, the drawframe is the next stage. 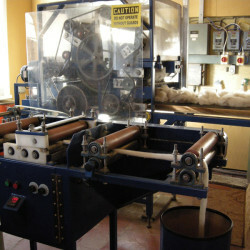 Two or three bins of rovings at a time go through this machine, being stretched and further re-aligned before spinning. The wool is spun into singles on the 8-spindle spinner and then plied on the 4-spindle spinner. 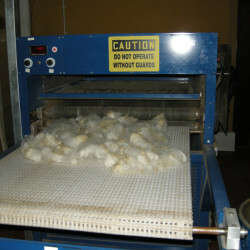 The twist is set on the steamer before going on to cones or into hanks. 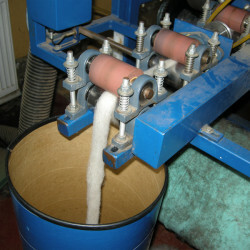 The felt machine makes sheets of felt approx. 36’’ x 48’’ in various thicknesses. The establishment of the wool company and the wool mill has enabled the producers to get a better return for the wool of the native sheep, thus helping the future of the breed as well as the island economy. It has also created jobs in the island and opportunities for knitters and crafters elsewhere in Orkney to access North Ronaldsay yarn and produce distinctive products. We also sell direct, and from our online shop can supply from the island a wide range of yarns and some knitted products as well. We have hanks of natural coloured wool, in Aran and 2ply, and there are batches in other forms. These include wool carded into batts, and also rovings, ready for hand-spinning or felting. We also supply bags of various lengths of wool in assorted colours and plies, left over from different batches, which can be used for a variety of small crafting projects. The short fibres left over from the carding process are which is good for stuffing and felting, and we sell these in 200g bags. The availability of the wool has stimulated many new ideas, from new knitting designs to woven rugs, cloth and tapestries. There are various articles online about the sheep and their wool and the mill, for instance on the Wovember site and also at Northern Lace. An article by Gordon McLachlan from Thurso looks at some aspects of their diet and adaptation. A film made in 2014 by David Bodenham is available on YouTube. Jane Donnelly, from Purtabreck in North Ronaldsay, has looked after island sheep and been involved in wool crafts since early days, and has managed the island wool company A Yarn From North Ronaldsay from its outset.